My love for fashion and most likely for vintage as well came from my grandmother, Melba Collins. She was always polished. She had strawberry blonde hair like me and pin curled it every night before going to bed for her entire life. She wore scarves when she went out to protect her hair and had matching nightgown sets. When my sister and I were teenagers we would raid her closet. She always had the most unique style. 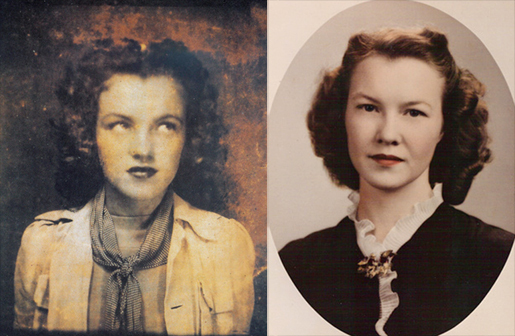 I recently found a photo online of Marilyn Monroe when she was 12 and it reminded me of Melba. Here are their photos side by side.